Happy Easter to everyone!!! Kids got tons of candy from friends and school and I am in the hunt to find their hiding spots and keep them away. But they somehow sense my hiding spots. I remember the same story with my brother and me; my Mom used to hide the candy from us as we liked to feast on them when we were young. My brother was an expert in detecting my Mom's candy hide out spots and we used to sneak in and eat the candy secretly. I see wrappers all over the place in my house and I have to make my little one pick it up as he is the one who likes to leave it where ever he wants after gobbling them. But the good thing about them is that they share the candy with their cousins and friends too. The amount of frosting will be good enough if you are making a three layered cake otherwise there will be left over. So instead of making a three tiered cake, I made 2 tiered cake and a single layer square cake and the frosting worked out good to decorate the 2 cakes. You can reduce the recipe into half to decorate a 2 tiered cake. Bake two 8 inch lemon yogurt cakes by following the recipe for the lemon yogurt cake for each 8 inch cake. The recipe makes one 8 in cake, so you need 2 such batches. Refrigerate the cakes overnight. The cake will be flat at the top, so no need to cut the cake. 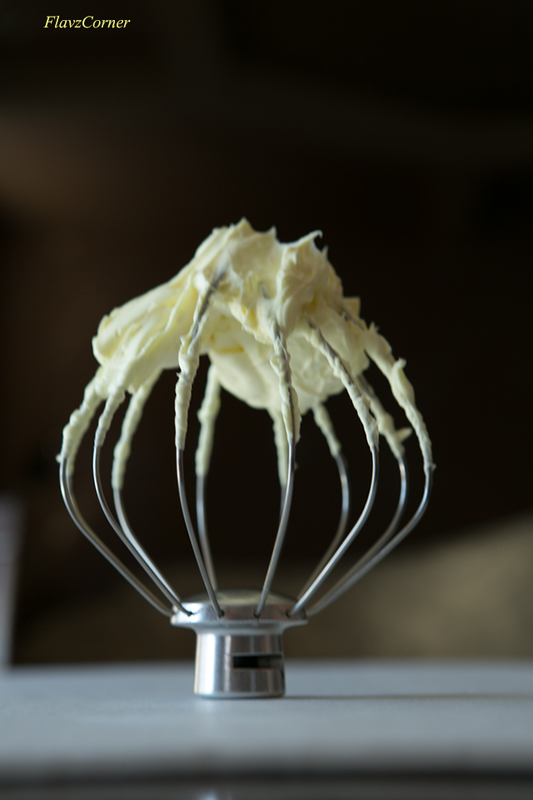 In a mixing bowl of a stand mixer beat the plain cream cheese till there are no lumps with the paddle attachment. Add the sifted powdered sugar and beat till smooth. Add lemon juice, lemon zest and color and beat for 30 seconds. Now change the paddle attachment and fit the whisk attachment. Add the cold heavy whipping cream and whip till soft peaks are formed. Apply the filling on top of the cake board and place the first cake. Apply dollops of filling on the first cake and spread evenly. Place the second cake and apply the frosting on top and crumb coat the cake with rest of the filling. Cover the cake and refrigerate till the frosting is prepared. There was little left over for me. Beat the cream cheese till now lumps are found in a mixing bowl of a stand mixture using paddle attachment. Now add butter and beat till the mixture is smooth. Add the powdered sugar 1/2 cup at a time and beat till all the sugar is used. Replace the paddle attachment with whisk attachment. Add the lemon juice and lemon zest beat till stiff peaks are formed. Scoop out half of the white frosting and place in a bowl. 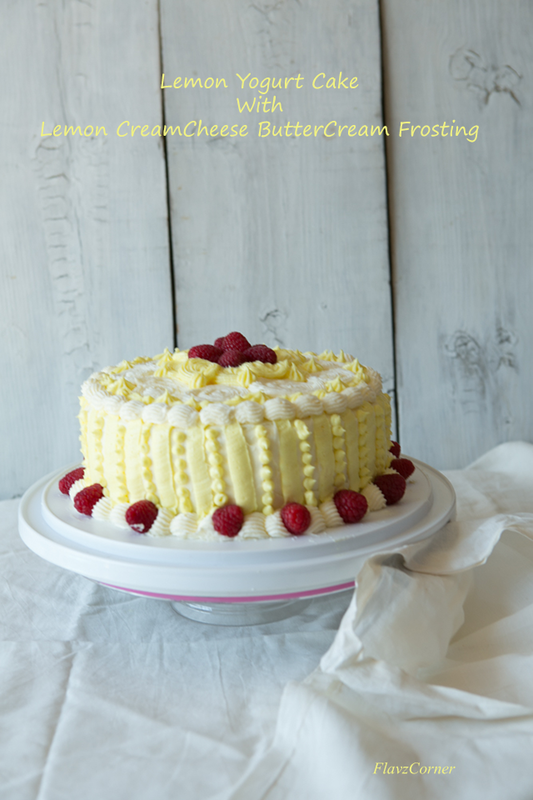 To the remaining white frosting in the mixing bowl of the stand mixer, add few drops of yellow color and whip till there are no streaks of yellow color are found and everything is mixed well. 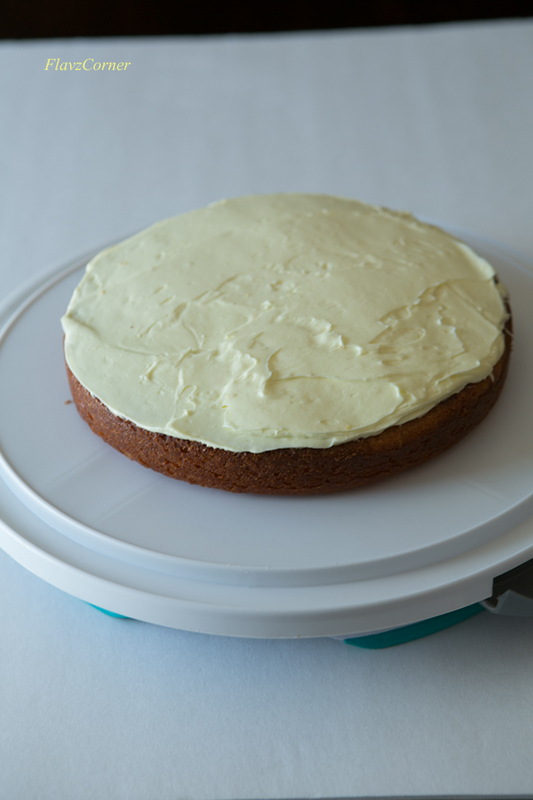 Frost the cake using a offset cake spatula with the white frosting. It was really hard to get the smooth edges as the frosting was not as stiff as butter cream frosting as I didn't add loads of sugar. I decorated the cake with #2D tip to make stips, #22 tip to make stars are swirls and the edges, #2A to make small round shape. I inserted few raspberries in between the edges. Refrigerate the cake if not using right away. 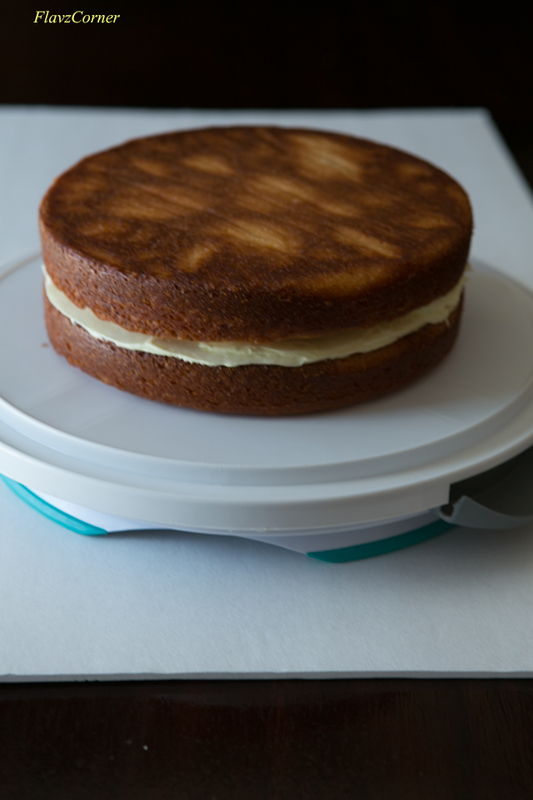 You can leave the cake outside for 2 hrs before cutting if the temperature is not too high. I updated the post with the Lemon Yogurt Cake recipe. What a beautifully decorated cake! So springy and delicious. Thanks Anupa!! 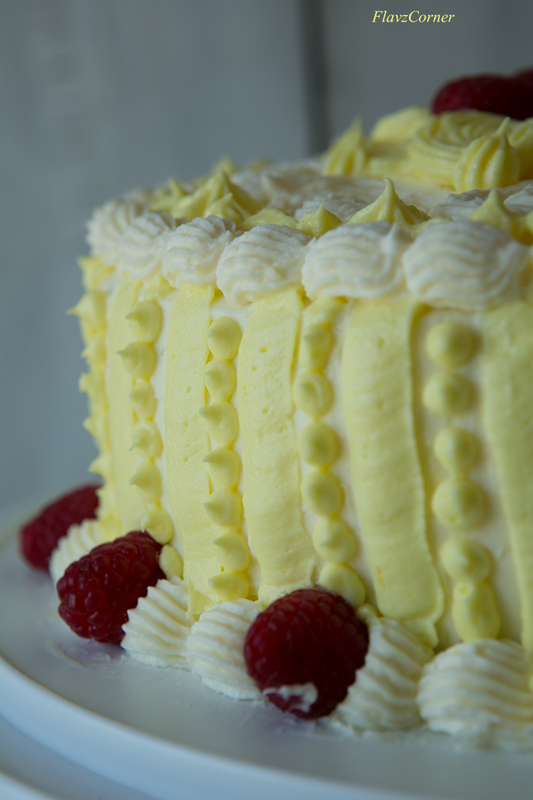 The lemony flavor went well with the spring color of the cake!! Wow, that is so impressive. yumm! Thanks Indu!! How is it going? Looks like you took a break from blogging. Waiting for your posts. Thanks Remya!! I made 2 cakes and both of them were finished. 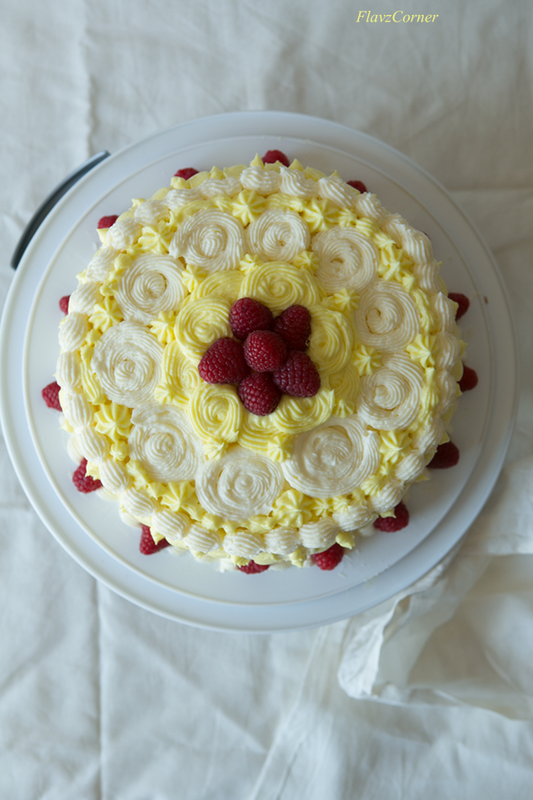 The lemony flavor went well with cream cheese frosting. Try lemon flavor, its refreshing and it will be a nice change to the usual vanilla and chocolate flavors. Yup, I always found my mom's hiding spots too. ;-) Used to drive her nuts! Anyway, gorgeous cake -- thanks for this. I can see that..driving nuts...my kids sometimes makes me feel that way too hehe :). Thanks John for the comment!! Oh yeah Anu, kids always outsmart us especially when it comes to sweet treats. Thanks for the birthday wishes and the comment! I usually don't fall for frosted cake but this one looks really pretty and yummmm I must say.